Taarab, the intoxicating Afro-Arab-Indian music from the East African coast, has been surprisingly available lately, if you know where to look. John Storm Roberts opened our ears about 25 years ago with his Songs the Swahili Sing (Original Music OMCD 024), and then Globestyle Records in the '80s kept things moving with a series of fascinating releases documenting the styles of Zanzibar and the Mombasa coast. These recordings may still be found with an assiduous search. Recently Buda Musique has launched the ambitious Zanzibara series, which promises new revelations. With everything else I've had going on, I'm just getting around to posting some of this music. I just finished digitizing about 24 hours worth of East African 45s that I've had stashed away on 10" tape reels, including a couple of taarabs. They were dubbed for me by Ron Sakolsky many years ago, and they're primo examples of the style.
. . . It was the strong cross-fertilization between taarab and dance music, the interchange of musicians and instruments, which produced the excitement of the new style and made it acceptable to the broader public. the Black Star Musical Club introduced guitar and bass guitar into taarab, the guitar often being played in the style well-known through Tanzanian and Zaïrean dance music. The normal line-up of the group featured the following instruments: 2 guitars, accordion, organ, taishokoto, bass guitar, rika and manyanga. Influences on the rhythms came from dance music (samba and rumba) as well as from local ngoma (dances of the different ethnic groups resident in Tanga and the vicinity). . .
Werner credits Black Star vocalist Shakila (née Tatu Saïdi) with establishing a new vocal style shorn of the melisima and vibrato characteristic of classical taarab. 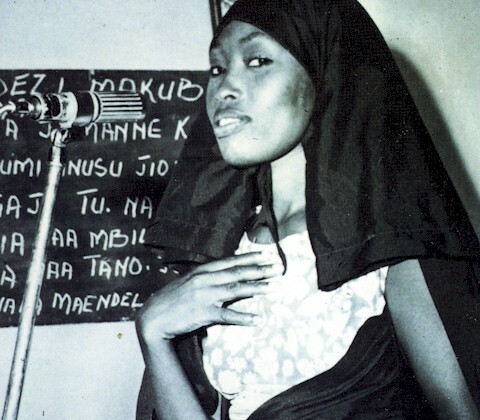 Shakila and her husband left Black Star in 1971/72 to establish a new group, Lucky Star Musical Club, which is featured along with Black Star on Nyota. More taarab can be found at Sterns or on Amazon.